Sunflower Stained and Leaded Glass Window Custom Glass Design. "SUNFLOWER" STAINED GLASS WINDOW CUSTOM GLASS DESIGN CREATED BY JACK McCOY©. 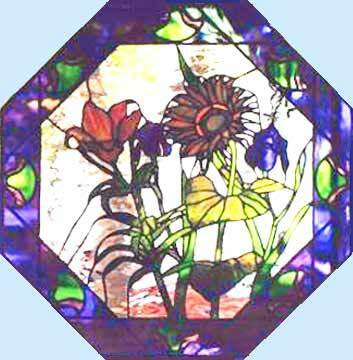 This stained glass sunflower and mixed flowers copper foil octagon window was 18" x 18".